I love turkeys! All kinds of turkeys. I should clarify that statement. We used to live near a turkey farm and the live ones aren’t my favorites. They are smelly, noisy and dumb as a stump. But, I love silly turkey cookies. 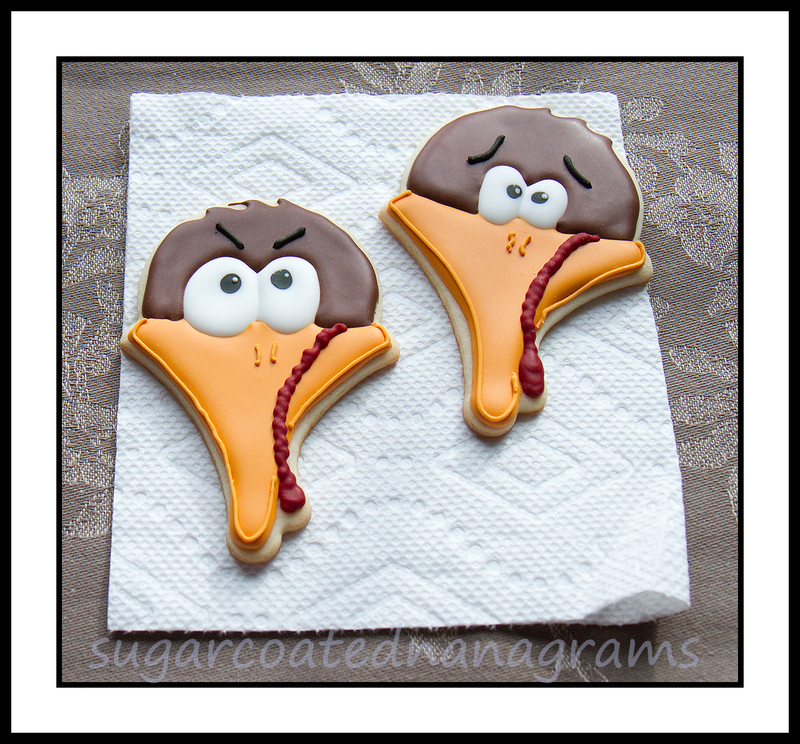 Every year I make a different turkey cookie. 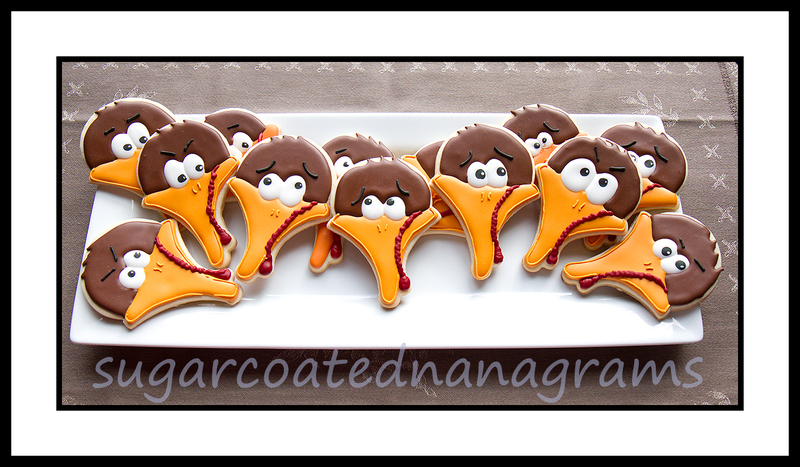 If I had more people to bake for I would make a bunch of different turkey designs each year, but at some point sanity must prevail, and I have to make a choice. These little guys were made with a sailboat cookie cutter. I wish I could tell you that I was clever enough to figure that out for myself but I can’t lie. I found this idea on the fabulous Bearfootbaker’s blog. They are really simple to do. I think the thing I like best is that you can give them many different expressions. Pupil placement and eyebrow slant will determine whether your turkey is afraid, happy, or angry. I used my usual sugar cookie and royal icing recipes. Once your cookies are baked and cooled you can start working on the faces. Do a simple sketch of where you want to put the eyes. I also made marks to remind myself that I wanted make their hair a little wacky. I used a pencil to sketch on the cookies. Sometimes I use edible pen markers and sometimes I use a pencil. It depends on what design I’m working on. Pipe one eye and pupil. I use a small table fan to help my frosting crust quicker and prevent craters. Using a fan has cut my decorating time substantially. I no longer have to wait so long between steps. The other advantage of using a fan is that it seems to help with color bleed. I had almost no color bleed from the wet on wet application of the pupils on the white eye. 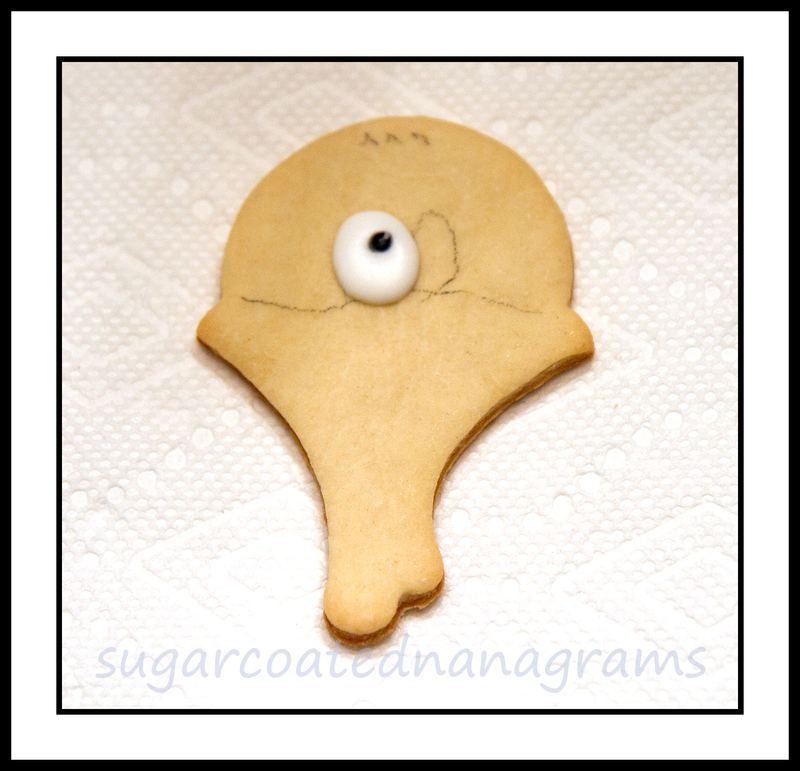 By the time you have the first eye done on 5 or 6 cookies they should be crusted enough to do the second eye. When you have both eyes done and they have crusted, it’s time to flood the beak. I forgot to take pictures of the next two steps but they are pretty self explanatory. 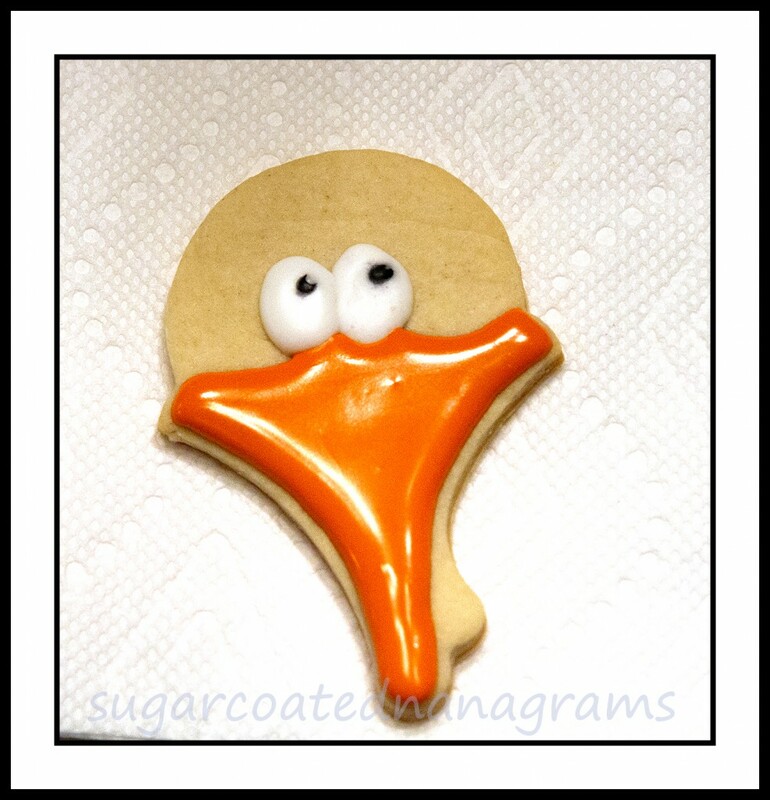 After the beak has crusted, flood the head with brown icing, add the nostrils on the beak, and then the red wattle. Set in front of the fan for an hour or so. I always let my cookies completely dry overnight before I put them in bags or containers. If you aren’t comfortable using a pencil, you can use edible markers. My favorite ones are listed FooDoodler Food Coloring Markers.